Residing in the murky borderlands between technology, art, media and the social sciences, Dr Yannis Zavoleas is seeking to construct and promote a new agenda for architecture in the 21st century. Some of the world’s most startling discoveries have emerged from deep within the crossroads – a place where ideas from different fields meet and mutate, detonating an explosion of the extraordinary. Few scholars enter, and even fewer use it to their advantage. Dr Yannis Zavoleas, a celebrated, practicing architect since the mid 1990s, is one of the latter. “My research is very interdisciplinary,” he acknowledges. I study biological organisms and how their behaviours and interactions with the environment give way to thoughts of physical spaces as dynamic entities. At the same time driven by a need to understand and respect the integration of technology into these principles of nature, Yannis is seen to be challenging the traditional methodologies of design. Armed with an array of digital devices, he’s looking to open the floodgates of creativity in all phases of architectural production as well. “With sophisticated software and machinery like 3D printers, I am able to manipulate structure and shapes,” the bilinguist affirms. Dually encouraging and supporting synergies between the computer and the drawing table, Yannis’ work is a scrupulous mixture of novelty and familiarity. “My discipline is neither solely about pure form finding, nor broad theoretical issues,” he maintains. Yannis completed two Master’s degrees in the United States of America, in Architectural Design from University of California Los Angeles (2000) and in Comparative Media studies from Massachusetts Institute of Technology (2004) before undertaking a PhD at Greece’s National Technical University between 2007 and 2011. The accomplished researcher also worked in film postproduction at Sony Pictures Imageworks in Los Angeles, California. “During this period I played around with 4D animation tools – time being the fourth dimension,” he recalls. 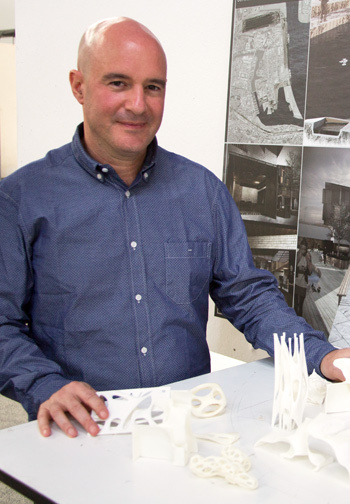 A continuation of his research at Master’s level, which fabricated the idea of “space as a medium,” Yannis’ candidature sought to trace the recent history of architecture. “I followed it from the middle of the 20thcentury right through to the beginning of the 21st century,” he specifies. Jumping from stepping-stones to building blocks, Yannis looked to tease out notions about physical spaces and dynamic entities. Helping to form the kernel of his own methods of creative thinking, this doctoral work simultaneously saw the prolific publisher dabble in the digital arts. Yannis relocated to Australia after teaching and researching at Greece’s universities from 2004 to 2013, signing on to become a senior lecturer at the University of Newcastle in July. Now the co-ordinator of a main design studio for its Master of Architecture program, the passionate educator is striving to challenge the limits of this place by also keeping pace with what is happening abroad. “I’ve taken a new approach to schooling,” he comments. A loyalist when it comes to research topics, Yannis is pursuing the concept of Bio-structuralism too. Faithful to his origins in biology and design theory, he is currently penning a piece on architectural dynamism as well. Drawing on references from biological themes in order to create “highly efficient” archetypal 3D structures, the multitasking scholar is aiming to solve problems related to physical space. “Observing and simulating the interactions and relationships of core architectural elements such as walls, columns and slabs, enabled me to see them as breathing archetypes of physical spaces, and expand on their potential as dynamic responses to the phenomena they support,” he explains. Yannis presented a paper at the Architectural Scientific Association’s annual conference at the University of Melbourne in 2015. Artistic and technical in equal measure, his keynote speech addressed the notion of ‘model’ and its significance in the creative process. Research refers to a broader area that challenges enduring assumptions about the notion of ‘drawing’ and the processes of ‘making’ this time approached under the digital influences, as these were presented internationally at CAADRIA in Kyoto Japan in 2014, Biodigital Architecture and Genetics in Barcelona Spain in 2014, Dortmund and Koblenz in Germany in 2014 and 2013. “I’m disengaging from the aesthetic aspects and focusing on the behavioural aspects and functions seen as interactions among different entities” he clarifies. Faithful to his origins in biology and design theory, Yannis is currently penning a piece on architectural dynamism as well. “I see core elements, like columns and slabs, as living, breathing archetypes of physical spaces,” he elaborates.